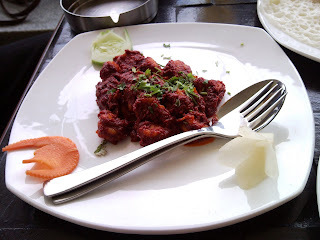 Bangalore restaurants- Food and Travel: Cirrus(ly) awesome!!! When our good friends Seema and Swaroop told us of a restaurant venture they had gotten into with Swaroop's brother Amit, we couldn't wait to check the place out. 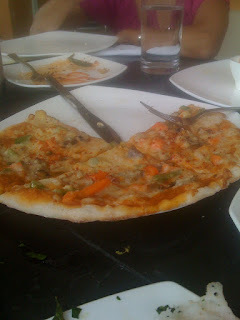 Cirrus is located on 100ft road Indiranagar, right after the Sony signal. You will find a Reid and Taylor showroom on the left. The restaurant is on the 5th floor of this building. Cirrus has two seating areas, an indoor one that, along with regular seating has an open bar space and stools at the bar. This leads to a semi enclosed outdoor space with wooden seating fixed to the wall. The view from this area is spectacular. We went there for a long lunch and I am sure the night time view will be worth the visit. Now for the food. Sluuuuurrrrppppp!!! We started off with beers and a couple of cocktails and mocktails. We were having a Manipal reunion of sorts and we had all the time on our hands to check out the menu. 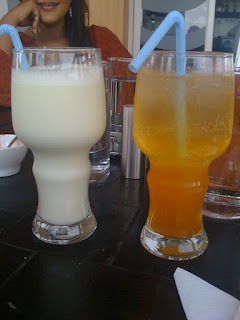 I had a Zephyr which was peach, lime, 7UP and dash of apricot. 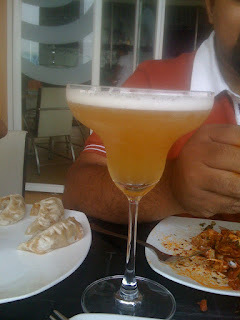 Kinnari, had a Maestro which was green apple and pineapple with cream and Sudhakar opted for a Sundowner which was fresh pineapple juice, whiskey and a touch of chocolate!!! The verdict on all three - YUMMMMMM. And we all ended up taking more swigs from his cocktail than would make him happy. The meal for us was more of starters than actual main courses. We ordered neer dosas to mop up the yummy masalas and gravies that were left behind. What is great about the menu here is that it is a great selection of classic, all time favourite dishes and will leave you wishing you had room for just one more dish. We started off with the prawn ghee roast - the dish was spicy, loaded with ghee and was the perfect combination with the beer. Sudhakar decided to get his hands messy and opted for the Crab masala - the masala was fiery red, and the crabs wholesome in the true sense. 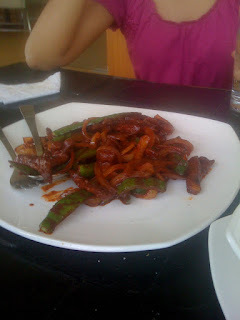 Next came the pork chilli, the pork was cut into strips and it was the right balance of fat and meat. The fat was perfectly fried and crunchy just the way I like it. The chilli was in moderation and was great. 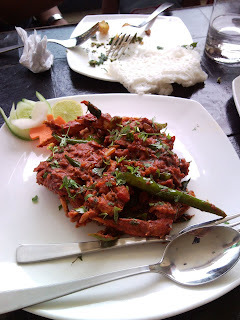 We also ordered a Hariyali Chicken which is on the spicier side and great since we love spice. We ordered neer dosas which were as soft as the ones we make at home which is a rarity in restaurants. Now for the vegetarian side. Kinna ordered the oven baked pizza with mushrooms and oodles of cheese. The crust was thin and crunchy and yummy. 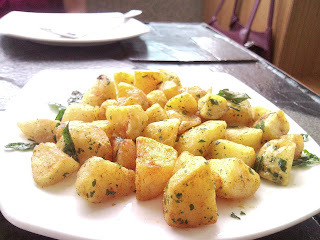 We also ordered two rounds of golden potatoes primarily for my little brat. The potatoes were soft and seasoning good. 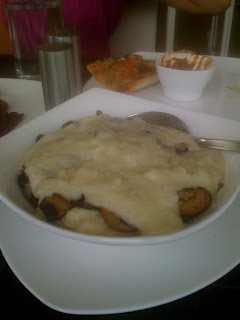 We also ordered a round of mashed potatoes with mushroom sauce and it was here that Sudhakar felt the chilli oil that was served in Little Italy would make the dish complete. There was also a round of veg steamed momos which Kinna declared as good. The restaurant is a great place for a long and leisurely meal be it dinner or lunch. The decor is great and the service prompt. Baby seats, though not available when we were there are not really a necessity since there is ample space for toddlers to explore. For those with a sportive streak, there is game room with Nintendo WWII. The meal for four with drinks and a field day when it came to ordering was in the range of Rs 2700 which is worth every penny.